A few weeks ago, I posted this to instagram as a riff on the popular What I Ate Wednesdays. I've never really vibed with the WIAW's because I feel like they can end up feeling very "perfect" looking and imply that we should be eating one way or another. This is a fine line with almost anything on the internet nowadays but it got me thinking. So much of intuitive eating, moving, living has to do with our intention (the why vs the what) so I wanted to represent that in - not so much in what I ate - but why. SO, here I have a few pics of things I ate over the past couple weeks, what was going on at the time and why I ate them. Reasons include things like hunger, meal times, convenience, it looked good, feelings, satisfaction, social outings etc. Of course, a disclaimer should be that this is also not something to compare to or replicate. 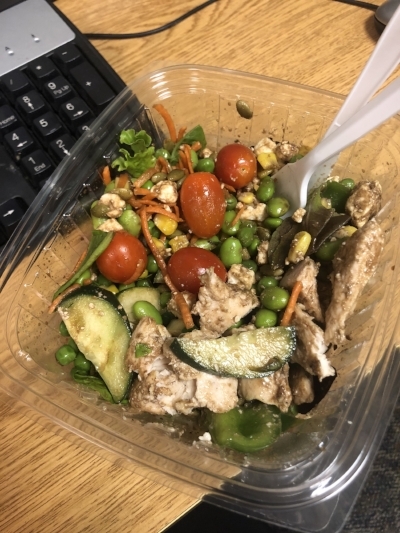 The pictures I'm sharing, I think, show some variety of foods that were in my weeks AND there were lots of other things in between! The point is, intuitive eating doesn't look a certain way - it's not all plain salads, or smoothie bowls and it's not all brownies and ice cream. It's foods that nourish you, satisfy you, foods that you can afford, that are appropriate for your lifestyle, that fill you up - physically and mentally - and make you feel good! They're foods you can eat with flexibility and most of the time without stress. I hope these meals and snippets of my intuitive eating shed some light on one person's experience and maybe make you think about your own 'why'! I ate a variety of foods that I know make me feel good and energized, some that were for fun and satisfaction and some because they were convenient and helpful! I think when we compare what we eat to someone else on any certain day we tend to focus things like calories or points or “good” or “bad” foods or an amount of physical activity in the day. It’s easy to forget that we’re the only ones who can decide what works and feels good and satisfying for our body at any moment. For example 👉🏼 I ate in the morning because I was hungry and because I know my body feels best when I start the day with a satisfying breakfast. I had a coffee because it’s one of my favorite ways to start the day. I ate again because it was my “lunch time” and even though I wasn’t quite where I would have intuitively stopped to eat lunch, I knew I wouldn’t have a break for another few hours so made time to pause and eat. I ate because the chocolate truffle someone offered me looked and sounded delicious and satisfying (it was). I ate a random snack I had forgotten about in the intern fridge because I was hungry for a snack. I drank some kombucha because it was refreshing and I liked the taste. I ate a leftover random bar I found in my bag because I stayed at the hospital longer than expected and needed something to hold me until I could have a more satisfying meal. And then I got home later than planned, feeling a bit past my normal hunger and I ate again. Hard boiled eggs are one of my go-to breakfasts for days I am really unprepared or in a rush. They satisfy and fill me up for a couple hours or enough time for me to get my morning started. They are also sold at Cafe Nero and the hospital cafeteria if I'm really in a pinch! Opposite kind of morning! I had lots of extra time this AM and it was during a week of my outpatient rotation which was conveniently located next to Whole Foods (great for me, not great for my wallet on an unpaid intern's budget haha). Got this omelette, some veggies, raspberries and a coffee. Was a really satisfying mix and exactly what I wanted at the time! I actually had some leftover that I added to my lunch later in the day. A slower weekend morning meant some more time to make something more satisfying and I was really in the mood for some breakfast tacos. Big fan of breakfast tacos. Kylie, Robyn, Connie and Haley have all been riding this wave too and I'm honored to be in such good taco company. These were a splurge on some Siete tortillas with hummus, baby kale, egg and salsa. I'm pretty much always an egg + salsa person, which I argue is much different than eggs + ketchup. Moving from NYC to Boston, I eat out a LOT less. Which surprisingly is more convenient here because the takeout options seem much less prevalent. But every once in a while, I really don't want to cook or even throw something easy together so I'll run down the street to Life Alive Cafe. After work one day this week I was feeling super drained and just wanted something that tasted delicious and I wouldn't have to cook (even though I did have a full fridge) so I picked this up on my way home. At the hospital, we get $7 meal tickets for daily lunches so most days the other interns and I always will buy from the main cafeteria. This is a mish-mosh of the salad bar that has a TON of variety. Depending on my hunger, what I'm in the mood for, (and how much time I have to eat!) I'll also grab a bag of Food Should Taste Good chips, a Mojo coffee, a fruit or a soup. Luckily, there are always snacks and chocolate in the intern office if I'm in the mood for something sweeter! Now that the weather is warmer, it's so nice to be able to take lunch outsides on days when I have a long enough break. One of the perks of outpatient has been the 1 hour lunch breaks (was not having that inpatient!). Taking full advantage and went to our Riverside Cafe under the outpatient oncology center instead of the usual cafeteria to get this quinoa bowl that was the perfect mix up to my usual lunch! I shared the table and was able to have such a nice lunch chat with someone who was on her way to becoming an NP, so we bonded about unpaid internships and how much we loved MGH. This bowl is actually a recipe made by one of my friends and co-interns, Sydney! One of our rotations is 4 weeks in different retail locations throughout the hospital. So you'll basically get to see and do every aspect of running a cafe, from management, to ringing up customers and making orders, to cooking the food, to recipe development, purchasing and marketing. We each also add items to the cafe menus that are then implemented into the menu rotations (so cool)! Back to Whole Foods for their hot and cold bar for lunch one day. This was actually not as satisfying or filling as I wanted it to be so I ended up having an afternoon snack a little sooner in the day. Definitely not Insta-worthy but I think it's important to show those meals too since it's easy to think that every meal is picture perfect if that's all we see! This was super satisfying one-pot dish that I made ahead for the week. A mix of ground turkey, salsa, some veggies and beans, greens and broccoli and some parmesan cheese. I was grateful to have it ready to heat up after a few extra-long days last week. One of the projects we have during outpatient is to trial a Medical Nutrition Therapy (MNT) diet for 3 days. The point is to better understand and relate to patients who may actually need to follow these diets. Since my rotation is toward the end of the internship, many of the diets offered had already been crossed off the list so I was left with a few options and chose the Blenderized Diet. I gave a lot of educations on this diet during my surgery rotation and it's often used when patients have had jaw surgery or chewing/swallowing difficulty that prevents them from eating solid foods. I'm not big on drinking my meals and not a huge fan of smoothies so knew this would be hard, and wanted to do "really experience it." Man, was I not into these three days. I mostly tried to blend up real foods (I even did blenderized mac & cheese because that is on the inpatient menus #commitment) but was really not into the whole drinking instead of chewing thing. So I ended up buying a few blended drinks "out" to add some variety to my days. This all really brought home the fact that a juice/smoothie/drink-instead-of-eat diet would not be for me, BUT now I know how hard it is if I ever have a patient on it! My friend's friend was in town for her birthday weekend and we celebrated at Capo, a restaurant in South Boston. This dish was delish and I created it by being that annoying customer who blends (no pun intended) two entrees together. I mixed the salmon (instead of mussels) with their pesto and spring pea risotto and it was BOMB. We also split some apps and wine and then stayed there for the rest of the night dancing and having so much fun. I had a cookie with my breakfast! For the last day of my outpatient rotation, I made these cookies for my preceptors! I notoriously do not follow baking directions. Whenever I bake something my roommate Alex (@fully_nourished_) always asks "what did you replace or leave out" first. Not for any reason other than me being kind of a lazy baker/recipe-follower. So in short, I couldn't even tell you what's in these, but they were peanut butter-chocolate chip and so good! Pizza, cheesy popcorn things, chips and guac, shared with interns. One of the best features of this internship so far has been the amazing friends I've made with the other interns! We have nearly weekly dinners that we either make or go out to together and it's such a fun way for us to all chill out, unwind and catch up on like outside of the hospital. Over MDW I went to Boston Calling with some friends. It was a long day in chillier than ideal weather. By the time we had been there for a while, we were all hungry and made our way to the many concession stands lined up. Whole Heart Provisions had a booth and I had been hearing good things about this place around Boston! I don't even know which bowl this is but it was SO GOOD and thoroughly enjoyed between running around to see different artists perform. And to end it all with some chocolate hazelnut ice cream and friends on one of those super hot days the other week. Nothing else to say here! How does this compare to your typical WHAT I Ate Wednesdays? What are your thoughts?